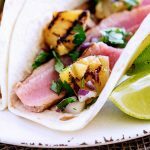 These Tuna and Chargrilled Pineapple Tacos are amazing! 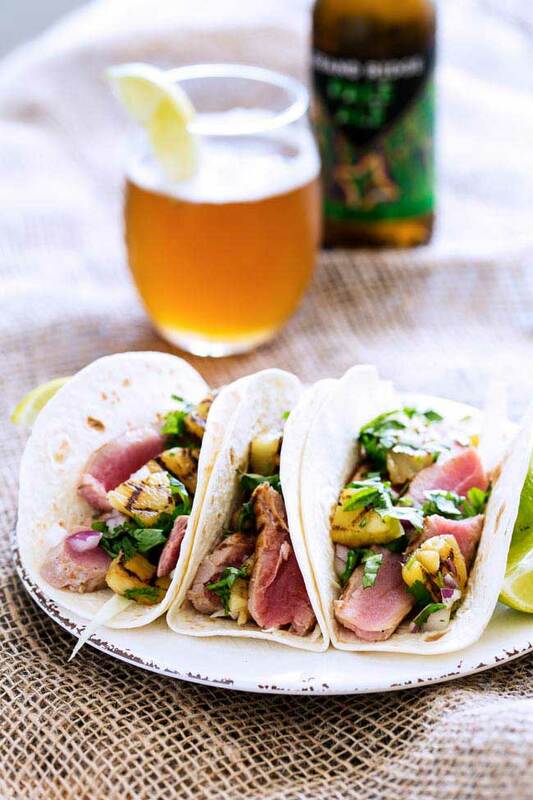 Slightly spiced tuna is seared and then stuffed into flour tortillas with a sweet and sour Chargrilled Pineapple Salsa. Today marks two years since my Granny passed away. Sadly she lost a battle with her kidneys! But she lives on in the memories of her 10 grandchildren! I am sure we all remember different aspects of her life and her interaction with us. For me, I remember her love of reading, her love of books and her love of fish (and chips). She used to buy and sell used books, and (until the fire) I had several old editions of Enid Blyton books she had given me. Anyway, I loved tuna, I loved swordfish and several years later (again on ‘Barry’ and Granny’s recommendation) I tried and loved shark! I can’t imagine not eating tuna/swordfish now (although I still detest the tinned stuff) But those meaty fishes are something that I enjoy at least once a fortnight. So ‘Thank you Granny x’. 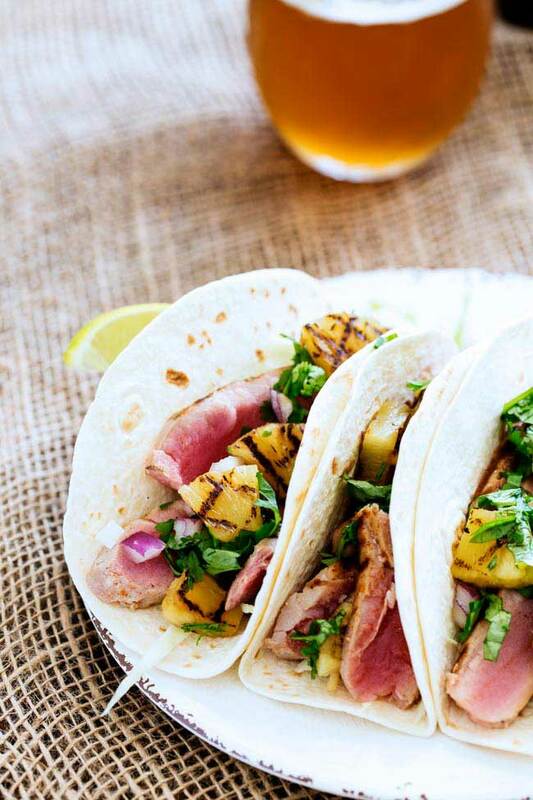 Which is how we get to these tuna tacos! I came up with this dish last week as I wanted to make a tuna salsa. It was delicious on it’t own, but when I wrapped it inside tacos I knew I had stumbled upon something good. 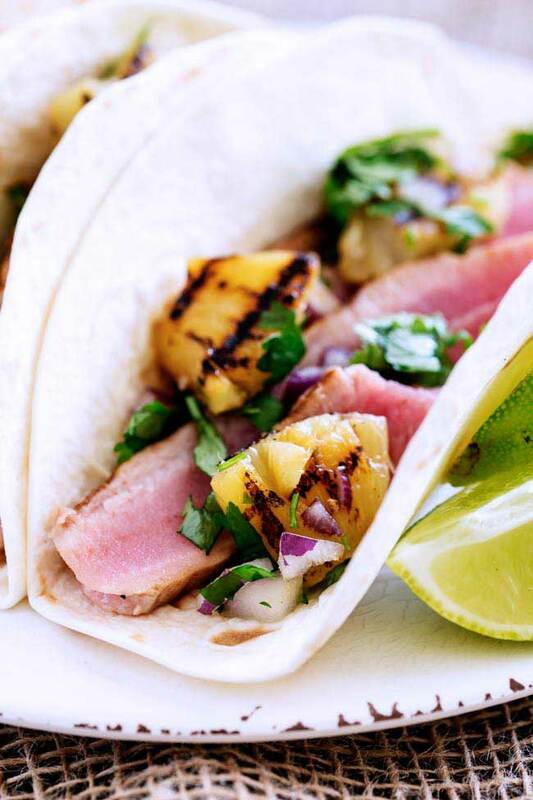 The meaty spiced tuna, mixed with the zingy lime and the sweet smokey pineapple. Man that is a little mouthful of heaven!!! So although it isn’t #TacoTuesday I am sharing this anyway. Because it is for my Granny and her love of fish and 2 because tacos aren’t just for tuesdays! That is just unfair! Why not make your own soft tortilla wraps with my simple recipe. Find it here. 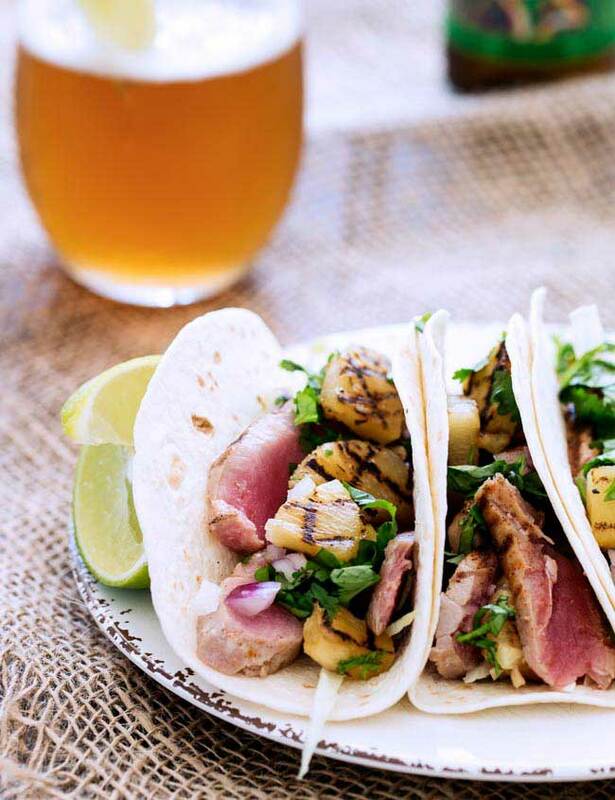 If you love this recipe for Tuna and Chargrilled Pineapple Tacos why not pin it for later. Place tuna in shallow bowl, dress with the olive oil, smoked paprika and ground cumin. Set aside. Meanwhile, preheat a grill pan over very high heat. Place the pineapple rings directly on the grill pan and don't touch it. You want the pineapple to caramelise and get the beautiful char lines on it. 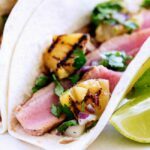 When the pineapple is charred, remove it from the grill pan and set aside to cool. Chop the red onion and jalapeño into fine dice, place in a non-reactive bowl, squeeze over the juice of the limes and sprinkle over the salt. Chop the pineapple into chunks and mix everything together. Take a sharp knife and cut the tuna into thin strips. Chop the coriander and mix through the salsa. Serve everything in warmed flour tortilla. If you love food why not subscribe to my newsletter, I will drop you an email every now and then, just to say hi and send you a couple of recipes I think you might love. It isn’t everyday! I am not that organised. Usually it is once a week (ish). 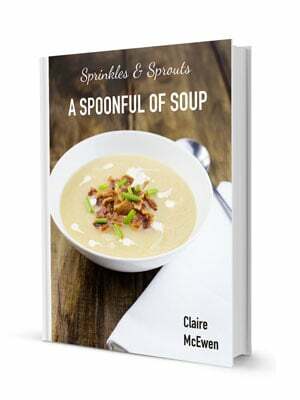 And as a thank you I will send you my soup cookbook FREE. Full of my fav soups! Hi Claire! OMG you sound just like me! I hate canned tuna especially when I see it is mushed up with mayo! Yuck! However I really, really love fresh tuna, shark and swordfish cooked rare! And you know I love pineapple, especially when it is grilled! Stuff this in a tortilla and I am one happy woman!